Propane CHP systems produce both heat and electricity at peak efficiency, and they can also provide backup power. A propane-powered Combined Heat & Power unit (CHP) is an engine powering a generator to produce electricity. It then uses the heat that's generated to heat your home and water. Compact and quiet, CHPs are ideal for homes, multi-family dwellings, and small businesses. Not only are they incredibly efficient, propane CHP systems contribute far less harmful emissions that negatively affect human health compared with electric grid power. Keep exploring to learn more. Discover how a quiet, compact Combined Heat & Power (CHP) unit can power and heat your home or business. A video featuring Marathon Engine Systems explaining the benefits they've experienced with a propane-powered combined heat and power system. A calculator that helps you identify the economic viability of CHP in your projects. 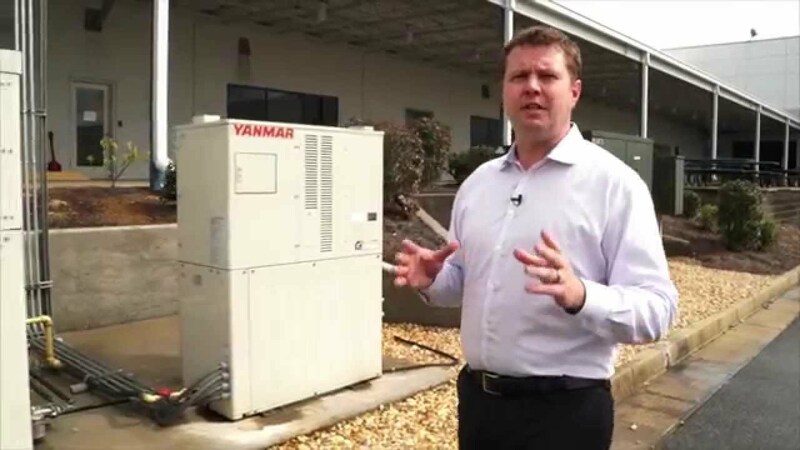 The Building Science series visits Yanmar and Blossman Gas to learn more about combined heat and power. What is a combined heat & power system? A combined heat & power (CHP) system uses a propane generator to create electricity that powers a commercial building. Simultaneously, the heat from the engine is captured and used to create hot water, further reducing energy costs. How are CHP systems used? CHP systems can slash utility bills for a variety of commercial buildings, including hotels and resorts, due to their year-round hot water load for laundry, pool heating, guest rooms, radiant heating, and more.